A trolling motor circuit breaker is designed to "trip" at a certain amperage, which breaks the circuit and prevents the motor from overloading and damaging itself. At between $20 and $40, they are significantly cheaper than purchasing a brand new motor! Circuit breakers come in varying amperages, and you want one that has an amperage rating (or amperage trip point) that is just above the amperage draw of your motor at max speed. Both Minn Kota and MotorGuide make their own breakers that are rated to break at an amperage level above what their motors draw. As just about all Minn Kota motors pull less than 60 amps at full speed, the Minn Kota circuit breaker is rated at 60 amps. The reasoning is that if 60 amps is being drawn from the Minn Kota motor, it's operating above the level it was designed for, and should be tripped. MotorGuide's motors are mostly rated for 50 amp breakers. 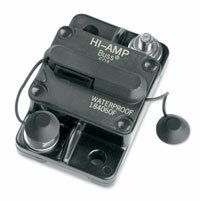 The exception are the MotorGuide Xi5 80 series, which require 60 amp circuit breakers.